Inspired by the fact I’m currently reading Harriet Walter’s latest book (Brutus and other heroines) and would love to chat with someone about it, I’m planning to start a theatre book group, specifically for people working in theatre in the region. If you think you might be interested I’m planning an initial meeting in Nottingham January 2017. Contact me if you’d like to be kept in touch about the details. I’ve got some new projects I’m really excited about happening this month, as well as existing shows out on tour. End to End, the Gramophones show I directed is heading back out on tour again, this time up in Scotland. Ava Hunt is off to New Zealand to perform Acting Alone at the Performance of Hope conference in Auckland. When she returns the tour continues in the new year with dates in Buxton, Halifax, Camarthan, Nottingham, Chesterfield and Frome. Tour dates here. The final week in November I’m working on a development week for a new script by Leicestershire-based writer Marilyn Ricci, called Soi Disant. You can read about the piece and the team here. I’m currently directing Man to Man by Manfred Karge at the Mercury Theatre in Colchester. It’s an extraordinary piece of theatre, telling the story of a German woman who disguises herself as her husband in order to do his job and claim his income. Karge was inspired to write the play by the same true story which prompted Brecht to write The Good Person of Sichuan, and both plays are being produced together at the Mercury in order to highlight this link. (Good Person is being directed by the brilliant Nikolai Foster and if the sounds we’re hearing coming through our rehearsal room ceiling are anything to go by, it’s going to be ROCKING). Man to Man is rarely staged in the UK and is best known for the 1987/88 Traverse/Royal Court production which gave Tilda Swinton her big break in theatre. Man to Man is a one-woman show, and the fantastic actor Tricia Kelly is playing the role of Max Gericke. As part of our rehearsal process we were fortunate to travel to Berlin to research the background to the play and the world of Max Gericke. While we were there we visited the Berliner Ensemble, hoping to get hold of a copy of the German text of the play to aid our understanding of some tricky sections. However, by a wonderful coincidence, when we explained we were working on a production of Man to Man, we were pointed in the direction of a man in a black overcoat and cap sitting on the other side of the courtyard, and told that this was the playwright himself! Although Karge’s English was as limited as our German, luckily he was with Berliner Ensemble dramaturg Herman Wündrich, who was able to translate some of the questions we had about the play. 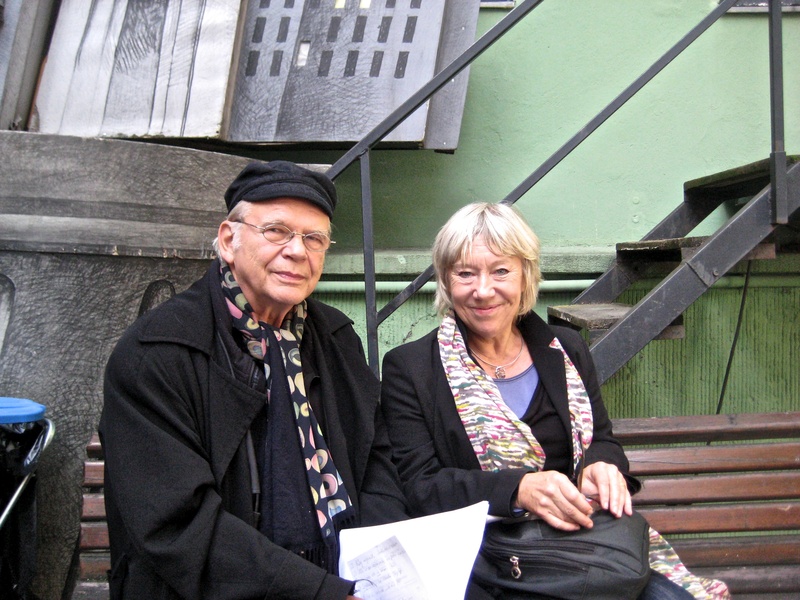 In the course of the conversation they also mentioned that Karge had written a new section for a recent production at the Berliner Ensemble. Man to Man was originally written before the Berlin Wall came down, but this new section brings the play up to date, dealing with that unforgettable night in Berlin’s history when Germany was reunited, and what it meant for Max Gericke. Karge sent us on his way with his blessing to use the new scene, and his final words were “toi toi toi!” – good luck! The Berlin Wall was still standing when Tilda Swinton played Max Gericke; our production will be the first in the UK to use this new scene. Man to Man opens on October 4th and is on until the 19th. Book tickets here.